I love these pretty colors for Christmas!!! 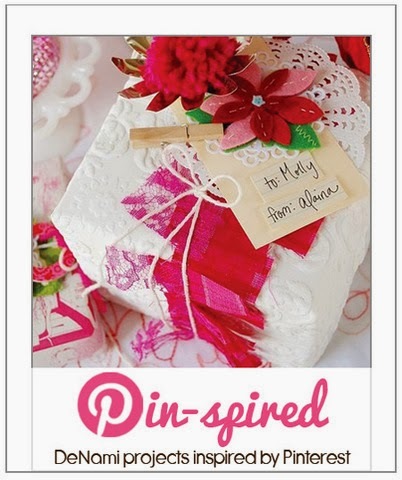 Your doily is the perfect back drop for your beautiful poinsettia. I think I am going to have to add that frame to my shopping card as well. Have a GREAT Wednesday! Sweet card and I like the font the Merry Christmas is done in. That and the doily are perfect with that color cardstock! Those really are awesome colors, Emily. And, I love that flower with the button center. Another very creative card. Love it! Hi Emily, Sorry it's been so long since I've been to visit. I have enjoyed catching up on your beautiful creations, especially this poinsettia! I wish you and your family a blessed Christmas and the best New Year! You and i took a page form the same book today!! A pretty paper doily, the Elegant Word Plate, Merry Christams sentiment...and I love what you did with yours!! Beautiful use of all those DeNami products, Emily--love this card! Such a beautiful poinsettia! I am picturing it with a fuchsia backdrop now that I've read your post...it *did* come across red to me. :( Those colors are so difficult to photograph, aren't they? Gorgeous card! I love fushia pink for Christmas. It's so girly and fun. Isn't it awful when something is no longer available after we fall in love with it and have so many plans for places where we could use it again. Nothing else ever seems to work quite as well.